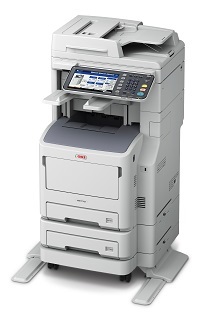 Taking aim at the mid-sized enterprise space, printer-maker OKI Data Americas Inc. released a fleet of 28 single and multifunction printers (MFP) on June 13, geared towards different sectors like education, healthcare and retail. Trying to be a mid-sized business’ one-stop shop is a huge shift for the company, which celebrated its 40th anniversary in December 2012. OKI made its product announcements during its First Look 2013 event in New Jersey June 4. “We’ve never been in the [mid-work group] space before, so that’s why for us, it’s a proud moment,” says Mario Pallotta, Canadian general manager at OKI. 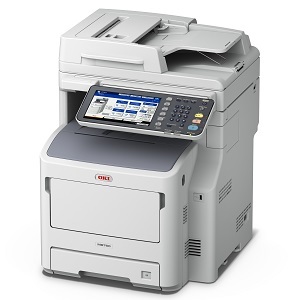 As part of its new printer lineup, OKI came out with a few models that are improvements on older printers, but are more specifically created for mid-sized businesses. There is the MB760 and MB770 MFP series, which can handle large daily print and copy volume. The MB760 can print and copy at 49 pages per minute, while the MB770 can do that at 55 pages per minute. They also have the ability to fax and e-file, meaning users can store digital documents on the printer’s secure hard disk drive, or scan to Google Docs, Microsoft Live 365 and other cloud-based storage options. Another important improvement to these printers is that when the toner runs out, that is the only piece that must be replaced. In other printers, typically users need to replace both the drum and the toner as they come together, but it is more efficient for mid-sized businesses if they can save on the cost of replacing drums and only do that when necessary, Pallotta says. These printers can also come as either standard or taller models, with the taller, more deluxe ones having finishing capabilities. And printers can start out as standard models and then have trays added to them as part of OKI’s smart extendable platform technology, which could be useful if a mid-level company wants to upgrade its existing printer. The MB760 starts at around $1,400, while the MB770 starts at $1,900. Both printers’ first customer shipments will be available to North American customers Aug. 5. Another series that might interest mid-sized businesses would be OKI’s high-performance colour MFPs, which create copies in bright, vivid shades. These printers are touted as adding value to any businesses that require marketing or showing proofs, like design agencies or real estate firms. Printing at up to 35 pages per minute in colour or 37 pages per minute in black and white on the MC770, or up to 42 pages per minute in colour or black and white with the MC780, these printers also have full fax, scanning and e-filing capabilities. A key selling point on the MC770 and MC780 is that they can come with hubs for PaperCut MF, a software that requires users to use a security badge or password to log in before they can start using the printer. The extra security feature prevents unauthorized users from seeing print jobs that are sensitive and not for everyone’s eyes. It also prevents employees wasting company resources, especially since colour ink can be very expensive, and it deletes print jobs that have been queued up for too long to prevent waste. In addition, the software works as a reporting engine to inform IT personnel about who’s using the printer and why. The MC770 starts at around $2,500, while pricing for the MC780 starts at around $3,500. They’ll be available in North America on June 17. While most of its printers were designed to service mid-market businesses, there are still some printers for SMBs on offer. 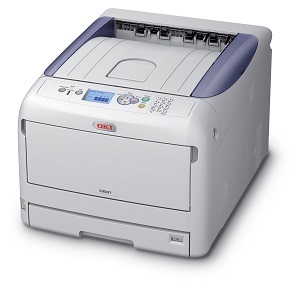 The C831 series, an upgrade from OKI’s previous C830 models, is a compact colour tabloid and A3 printer that fits comfortably on a desktop, for example. As a single function printer, it may have less bells and whistles than the MFPs, but it is an 11 inch by 17 inch printer that has been condensed to a small enough size to fit onto a table. Usually, a printer of that size would need way more workspace and would probably be a standing model, Pallotta says. As compact as it is, the C831 is aimed at SMBs and comes with a one-year warranty. Its starting price is $1,700 and it will be in North America June 17. And there are even smaller models like the C331, a single-function colour printer that starts at $349, with a three-year warranty. The C331 is available June 17 and is also touted as an SMB option. Still, OKI sees itself as increasingly interested in mid-sized businesses and it will continue to pursue that market, Pallotta says. “Mid-level is the most profitable space. What some manufacturers have done is get into the big box stores. That’s something that’s totally unprofitable,” he says, adding there’s just too much competition there to maintain a healthy business. He also says mid-level clients are looking for customizable options, something OKI can provide since 95 per cent of its machines are compatible with almost any software that mid-sized businesses use.